The Steelers have made the trade! No, not THAT trade, the one involving Antonio Brown. 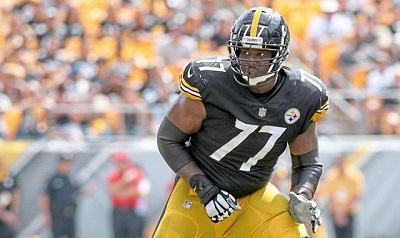 Instead the Steelers have traded offensive tackle Marcus Gilbert to the Arizona Cardinals for a 6th round pick in the 2019 NFL Draft. 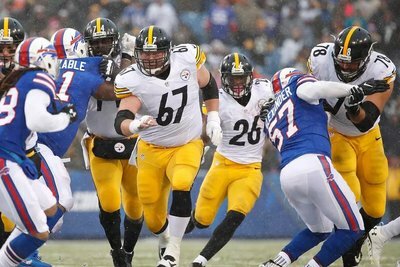 Some sort of roster move involving Marcus Gilbert was expected, although a trade is a mild surprise. Marcus Gilbert missed the last 11 games of the 2018 season due to injury after missing nine games during 2017 due to injury and suspension. Gilbert was in the final year of the contract he signed in 2015 and was due to make $4.9 million dollars, and it has been speculated that Marcus Gilbert could be a cap casualty. That speculation turns out to be correct. The day was September 11th, 2011, the venue was Baltimore’s M&T Bank Stadium and the result was one of the most humiliating defeats of the Mike Tomlin era. After defeating the Baltimore Ravens in 4 straight contests, including 3 in 2010, the Ravens struck back decimating the Steelers in the Debacle in Baltimore. During the game the Steelers lost Willie Colon for the year as the starting offensive tackle tore his triceps. The Steelers had played “Plug and Patch” on their offensive line up until that point in the Tomlin era. Many assumed the Steelers would look to either resign Max Starks or Flozell Adams, both of whom had been with the club in 2010 and cut during the summer. Flozell Adams did in fact offer his services to the team, but the price was too steep. The Steelers would again take the Red Phone to Max Starks, but that move came in October, when it became clear that Jonathan Scott was in over his head and woefully unable to protect Ben Roethlisberger’s blind side. The Steelers instead announced that Marcus Gilbert would start at right tackle. The decision was important because it signaled the Steelers commitment building a sustainable offensive line. And while injures kept him off of the field for much of 2012, he’s held down the position ever since, aside from rotating with Kelvin Beachum for a bit during the beginning of 2013. And while that commitment continues, trading Marcus Gilbert ends a phase of that cycle. 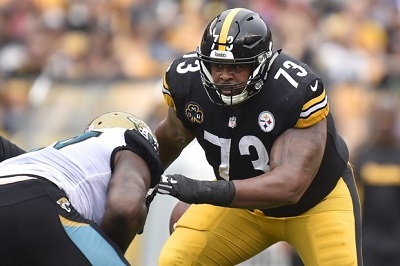 Marcus Gilbert deserves to be remembered as a player who provided the Pittsburgh Steelers with quality play at right tackle, helping stabilize a position and an offensive line that had under gone tremendous turmoil during Mike Tomlin’s first 4 or 5 seasons. Yet fate was not always kind to those who played close to Marcus Gilbert. During the 2012 preseason, Marcus Gilbert fell on David Johnson and David DeCastro, injuring both men and costing David Johnson the season in which he was to transition to becoming a full time fullback. Later on, during the 2015 season, Marcus Gilbert landed on Landry Jones, ending the young quarterback’s first start after just a handful of snaps. As the Steelers learned during the first half of the Mike Tomlin era, “You can never have enough good offensive lineman.” And $4.9 million dollars, is not a lot of money to pay a quality offensive tackle. But Matt Feiler did an excellent job of filling in for Gilbert in 2018, as did 2018’s 3rd round pick Chukwuma Okorafor. The Steelers will also bring back 2016’s 4th round pick Jerald Hawkins. 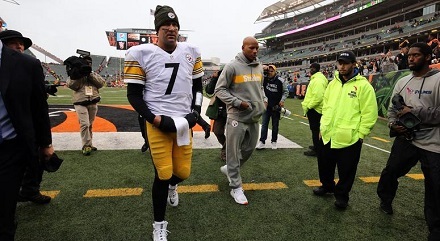 That, in addition to the decision to lock down Maurkice Pouncey and Ramon Foster, made Marcus Gilbert expendable. Steel Curtain Rising would like to thank Marcus Gilbert for 8 years of quality play for the Pittsburgh Steelers and wishes him well with the Arizona Cardinals. Things are happening fast on the South Side as the Pittsburgh Steelers have made a flurry of moves in anticipation of the start of free agency. First, the Steelers have resigned Ramon Foster to a two year contract. This news does not come as a surprise, given Art Rooney II’s comments about keeping the offensive line together. However, the Steelers previous decision to put a 2nd round tender on B.J. Finney opened the door to speculation that Ramon Foster might be allowed to seek a home outside of Pittsburgh. That will not be happening in 2019. In a move that amounted to a minor surprise, the Steelers also extended the contract of center Maurkice Pouency, who had one year remaining on his current contract. The move is reported to be a 3 year extension, and will keep him in Pittsburgh through the 2021 season. This move perhaps signals an imminent resigning of Ben Roethlisberger. The two players have vocally stated their desire to continue playing together, with one hinting he’ll retire when the other does. The Steelers usually resign players who have a year remaining on their contracts to extensions during the summer. Doing so now could be part of a move to facilitate Ben Roethlisberger’s extension, or the move could be happening now for salary cap reasons. As mentioned above, the Steelers issued a 2nd round tender to B.J. Finney who is a restricted free agent. Finney is free to negotiate with other teams, but the tender gives the Steelers the right to match any offer or otherwise will cost the other team a 2nd round pick. A 2nd round tender will pay B.J. Finney over 2 million dollars, although the Steelers could work out a long-term deal with Finney. The Steelers also offered an original round tender to Xavier Grimble. Because Xavier Grimble entered the league as an undrafted rookie free agent, the Steelers would not get any thing should another team sign him, but it does give the Steelers the right to match his offer. In all likelihood, the no team will make an attempt to sign Grimble. This move all but confirms speculation that the Steelers will allow Jesse James to test the free agent market. 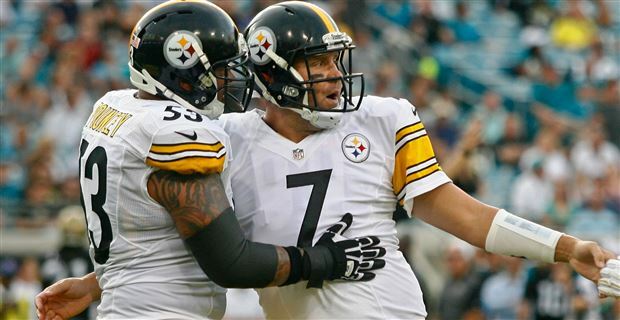 Finally, the Steelers also offered exclusive rights free agent tenders to Matt Feiler and Mike Hilton effectively keeping the duo in Pittsburgh for the 2019 season. As Exclusive Rights Free Agents either player can sign with another team, but the Steelers needed to make them qualifying offers to retain their rights. No word or mention has yet been made of tight end Jack McGee, tackle Joseph Cheek, linebacker Keith Kelsey and safety Malik Golden who are also Exclusive rights free agents. In our profile of the Steelers 2019 Exclusive Rights Free Agent class, Steel Curtain Rising erroneously asserted that the Steelers had tendered all of their ERFAs. That was wrong. As of now, only Hilton and Feiler have tenders. Should the Steelers Gamble by Not Giving Xavier Grimble a Restricted Free Agent Tender? For every NFL rookie that gets a dreaded visit from The Turk, a practice squad slot equals a lifeline to their NFL dream. What they make of that lifeline varies greatly from player to player. In the case of Pittsburgh Steelers practice squanders, on the one end of the spectrum you have James Harrison who worked his way to NFL Defensive Player of the Year. Xavier Grimble is a player who cut his teeth on the Steelers practice squad, an experience which he parlayed into an active roster spot. Now that he’s reached restricted free agent status, his spot on the continuum above will come into clearer focus. After spending time with the Patriots and the 49ers as an undrafted rookie free agent in 2014, Xavier Grimble joined the Steelers practice squad in 2015. In 2016 Xavier Grimble earned a slot on the Steelers active roster behind Jesse James and David Johnson while Ladarius Green sat out in the PAP list. Say what you want about back up Steelers tight ends, they may not catch many passes but when they do, they catch touchdowns. That was true of Matt Spaeth. Entering the 2015 off season, Matt Spaeth had only caught 53 passes, but 10 of those, or just under 20% went for touchdowns. Xavier Grimble is on a similar path as he has caught 22 passes but three of those have been for touchdowns. Yes, that’s only a 13% touchdown catch rate, but he’s been the number 3 tight end whereas Spaeth was TE number 2. In three years on the Steelers active roster, Xavier Grimble has appeared in 44 games and made 6 starts, including a touchdown against Cincinnati in 2016, a touchdown in the Steelers Christmas win over the Ravens, and a touchdown against the Packers in 2017. Of course the play that most fans are going to remember is the goal line fumble against Denver where Grimble initiated contact unnecessarily (while holding the ball incorrectly) which cost the Steelers the game, if not the playoffs. The Steelers have invested a lot Xavier Grimble’s development. After four years, Xavier Grimble clearly won’t morph into the 2nd coming of Bennie Cunningham, let alone Heath Miller. But arguably, Xavier Grimble has already contributed more than Preston Gothard did as starting tight end for some mediocre teams in the 80’s. The point is that Xavier Grimble is a serviceable player who provides valuable depth at tight end. Is Xavier Grimble worth the 2 million plus it would take to offer him a restricted free agent tender? Well, if Jesse James is playing elsewhere in 2019, then the answer might be yes. Even if Jesse James is back, the Steelers would be wise to keep keep this valuable backup in Pittsburgh. Practice squad to regular season roster stories may warm the soul, but don’t spontaneously sprout Lombardi Trophies. Sure, Xaiver Grimble is a decent number 3 tight end, but at age 27 he’s reaching the “What you’ve seen is what you’re going to get” phase of his career. With the Steelers facing the loss of Antonio Brown and Le’Veon Bell, Ben Roethlisberger is going to need dynamic targets to take heat off of JuJu Smith-Schuster and Vance McDonald. Is Xavier Grimble going to be that person? No. Even if Grimble makes it to training camp, there’s no assurance he’ll beat out Jake McGee for a roster spot. The Steelers would be better off parting ways with Grimble and bringing in a younger player who offers more promise. Jesse James’ free agent profile has yet to be published, but I’m going to go ahead and scoop myself and say that the Steelers should resign Jesse James and provide a solid number 2 behind Vance McDonald. Under that scenario, with Jesse James locked up for 3-4 years, the idea of spending the 2 million plus to put a qualifying restricted free agent tender on Xavier Grimble sounds like salary cap insanity. Moreover, the Steelers certainly could gamble that Xavier Grimble will still be available to be brought back at the veteran minimum if they decline to tender him. However, Kevin Colbert’s comments at the NFL Scouting Combine indicate that the Steelers will probably let Jesse James test free agency. That makes Xavier Grimble a more valuable commodity to the Steelers, but perhaps not valuable enough to warrant a restricted free agent tender. The NFL’s 2019 free agency signing period begins and one thing is already certain: The winds of change will sweep through the Pittsburgh Steelers roster this spring with a force that has not been seen since the 1990’s. The 2018 Pittsburgh Steelers roster is a product of the rebuilding effort that started following Super Bowl XLV. The Steelers 2019 roster will be very different. Antonio Brown is headed to Oakland and Le’Veon Bell will soon be gone to. The Steelers Killer Bees will be no more. Jesse James is reported to be headed to Detroit. Others will follow. Every NFL team endures change, but true championship teams come to embrace it. Here’s a look at the Steelers 2019 free agents, their free agent pickups as well as losses. 3/13/2019 – Steelers sign Steven Nelson, Cornerback from Kansas City to 3 year contract. 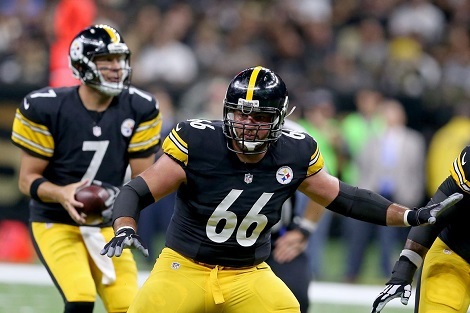 3/13/2019 – Steelers resign Anthony Chickillo to 2 year contract. Click on the player’s name below for a feature length free agent profile. The Steelers have already been busy in free agency, signing Tyson Alualu to a 2 year contract extension and informing Le’Veon Bell that they will not place the transition tag on him. 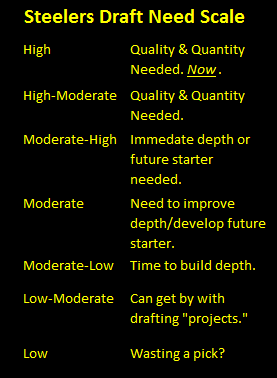 In the coming days Steel Curtain Rising will be publishing profiles of each of the Steelers 2019 free agents, following the same formula that we’ve used for the last several off seasons. We’ll begin with a capsule summary of the player’s career as a Steeler, the strongest argument one could possibly make in favor of resigning the player, the strongest possible case arguing against resigning the player, followed by our “Curtain’s Call” describing what we think will and should happen. You’ll be able to access all Steelers 2019 Free Agent profiles by clicking on our Steelers 2019 free agent focus category tag. The Steelers Took a Step Back in 2018. Can They Take One Forward in 2019? Who saw the Steelers in Super Bowl XLIII a year earlier after an ugly playoff loss to the Jaguars? How many pundits predicted a 15-1 ’04 season that ended in the AFC Championship after a 6-10 2003? Did anyone think the ’01 Steelers would finish 12-4 following a playoff-less 9-7 finish in ’00? Yet, if the “Steelers can take a step forward in 2019”storyline seemed promising going into the Bengals game, Antonio Brown‘s meltdown and impending trade complicates things, to say the least. We ask the question nonetheless. Examine the situation below. Le’Veon Bell is on his way out of Pittsburgh. That means that, assuming the Steelers don’t do anything stupid like trying to use the franchise or transition tag on him, you’re going to hear lots of Gloom and Doom stories about the devastation wrought to the Steelers over the loss of one of their best players. Don’t fall for it Steelers Nation. Yes, it probably would have been better had Le’Veon Bell signed the deal his agent and the Steelers agreed to in the summer of 2017. And as detailed, franchising Le’Veon Bell a second time was a mistake. But what’s done is done. James Conner and Jaylen Samuels showed that there is life after Le’Veon for the Steelers rushing game. We’ll say it again here and in the future, the Steelers absolutely must commit to finding a better third running back in 2019. But both men not only showed that they can rush the ball effectively, they’re also double threats. Another thing to ignore is all of the talk of the Steelers resisting the rushing revolution. Yes, the Steelers did pass at an insane rate in the 2nd half of 2018, but they almost certainly did so by necessity, not by choice, because the Steelers didn’t want to run James Conner into the ground. Don’t let the headline lead you to think I’ve gone delusion. The Steelers defense still has a long way to go even to approach its mid-2017 form, let alone progressing beyond that. And the stark truth is that there are roadblocks in the Steelers way that don’t include finding some way to replace Ryan Shazier. The Steelers defense gave up 4th quarter touchdowns with alarming regularity. The pass rush, while overall strong, couldn’t deliver at critical moments. Artie Burns looks like a total loss, and Cameron Sutton did not appear to take a step forward. Yet, if those warts are real, the 2018 Steelers defense did make some legitimate improvements. Moreover, if “Heinzsight’s” film analysis from 247 Sports Pittsburgh is accurate, the Steelers defense was much more sound schematically this year than in prior years, even if execution continues to be an issue. The Steelers offense also offers promise for 2019. Vance McDonald emerged as a legitimate weapon and, equally importantly, was able to stay healthy. Eli Rogers arrived late, but made almost an immediate impact. JuJu Smith-Schuster showed that his rookie season was no fluke. James Washington started slowly, but his work ethic is spectacular and he began flashing late in the season. The offensive line will undergo changes, without a doubt, as Ramon Foster could be gone, and Marcus Gilbert is likely gone. Losing Mike Munchak is a blow without a doubt, but the Steelers have a strong core, and Shaun Sharret shouldn’t be sold short. Most importantly, while Ben Roethlisberger‘s play was hardly flawless, he showed few, if any signs of losing a step to father time. The Steelers certainly have some holes to fill before the 2019 season. And there may be even more holes, if the organization really goes through with its reported desire to trade Antonio Brown. As for Brown’s mindset, and whatever it is that has been going on in his life from a personal and professional standpoint since before the start of the 2018 campaign, he also appears to desire a new home in 2019. Will the two sides work things out? Will the Steelers trade their star receiver–a man who has caught over 100 passes for six-straight seasons? The answer to that question will determine just what actions the Steelers will take in order to improve their fortunes for next year. 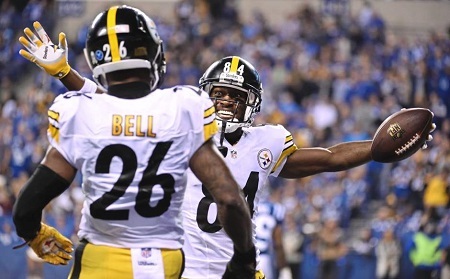 Let’s face it, if Brown is no longer the focal-point of Pittsburgh’s offense, that would leave the unit without both he and Bell, two of the game’s top play-makers in recent years. As much as fans may want to see those guys gone, it directly contradicts their long-held desire for Super Bowl success. If Brown does join Bell as an ex Steeler, will Smith-Schuster, a man who caught over 100 passes and made his first Pro Bowl in just his second season, be able to carry the torch for Pittsburgh’s offense? That’s one problem. Another is finding a play-maker for a defense that finished 2018 with just 15 takeaways. Yes, the unit did show signs of improvement at times, but it’s hard to be a truly great defense if you can’t take the football away. Maybe the answer lies in really going for it in free agency and finding a true replacement for Shazier. With more room to work with under the cap during the upcoming free agency period, we may get the answer. Finally, can the Steelers take a step forward in 2019? If you’re looking for solace, for comfort in the future, just know that the organization will do just about everything in its power to take that step forward. Some organizations are fine with some of the issues Pittsburgh is dealing with right now. The Steelers aren’t one of those organizations. This is a serious proposal. OK. Mike Tomlin’s eyes will never grace the pages of Steel Curtain Rising, let alone this article. But this is still and idea worth executing idea. As Jim Wexell suggested, Le’Veon Bell likely feels backed into a corner. Although he did threaten a hold out, he also indicated numerous times that he’d be playing for the Pittsburgh Steelers in 2018. Yet he’s missed milestone after milestone, and quite possibly feels like sitting out is his only face-saving option. And, there’s the business side of this equation to consider too. Le’Veon Bell has already forfeited 8 million dollars in change, and “only” stands to make about 6.5 million if he signs his franchise tender. 6.5 million dollars for less than a half a season is a lot of money even by NFL standards, but it pales by comparison to what Bell things and probably can make next spring as a free agent. All it takes is a torn ACL or blown Achilles and Le’Veon Bell’s 2019 signing bonus drops exponentially. Because that’s one bargaining chip the Steelers still have, because money can buy you a lot of things, but it can’t buy you a Lombardi Trophy or Super Bowl ring as Daniel Snyder and Neil O’Donnell can attest. It is true that if James Conner continues to play at this level and remains healthy, the Steelers strictly speaking don’t need Le’Veon Bell. As mentioned here last week, James Conner’s bruising running style carries costs. Moreover, while Stevan Ridley and Jaylen Samuels are not bad backups, but at this point I’d still rather have the 2010 or 2011 edition of Isaac Redman as my number two. 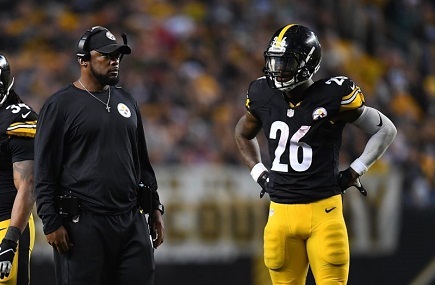 Mike Tomlin vowed to run Willie Parker until the wheels fell off, and as noted here in August, during the Tomlin era the Steelers have struggled to keep RB 1 and RB2 healthy until season’s end. Viewed this way, Le’Veon Bell signing his franchise tender even at this late date is a win-win for both sides. The Steelers get an immediate upgrade to the depth behind James Conner. Le’Veon Bell pockets 6.5 dollars, or more than his entire rookie contract. He has the luxury of getting into shape, and the security that Mike Tomlin no longer has a need to ride him into the ground. And, he makes a legitimate AFC Championship contender even stronger. Is there a Precedent for This Sort of Thing…? Word is of course, that Le’Veon Bell has already decided to sit. Who knows where that is coming from, but the report surfaced on ESPN and now everyone and his brother is reprinting it like Gospel. That’s a same, because having James Conner and Le’Veon Bell would give the Steelers their strongest, deepest backfield since 2004 when Bill Cowher had Jerome Bettis and Duce Staley at his disposal. Perhaps the better analogy would be 2005, when Duce Staley played little, save for a start against Green Bay that helped ensure a win. A win the Steelers needed to make into the playoffs en route to victory in Super Bowl XL. Sometimes stories yield their own symmetry. The last time the Steelers played and defeated the Carolina Panthers was in 2014. The game cost the Steelers the services of Jarvis Jones, then seen as an up and comer. It didn’t take long for the Steelers to hit the Red Phone to James Harrison. But it wasn’t only Mike Tomlin that picked up the phone. If reports are correct, Troy Polamalu, Ike Taylor and Brett Keisel called Harrison and encouraged him to come out of retirement. Mike Tomlin should not only call Le’Veon Bell, but get Ben Roethlisberger, Antonio Brown, Cam Heyward, Maurkice Pouncey and perhaps Ramon Foster to follow suit. A chorus of “Hey Le’Veon, do you want to win a Super Bowl” just might do the trick. Through the first four games of the 2018 regular season, it was factual to say that the Steelers highly-touted and highly-decorated offensive line wasn’t performing up to its usual standards. 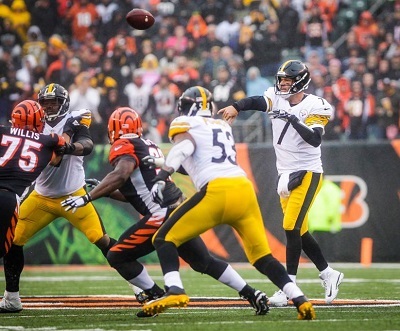 Quarterback Ben Roethlisberger was often under the proverbial gun and faced more pressure than he probably had become accustomed to in recent years, once the big guys up front became one of the most formidable units in all of football. One month into the season, Roethlisberger had already been sacked nine times, a number that put him on pace for 36 for the year. While such a sack total still wouldn’t have approached the ridiculous number of times Roethlisberger was taken to the turf in the days before the likes of Maurkice Pouncey and David DeCastro came on the scene, it certainly would have far-surpassed the average of 22.75 sacks No. 7 had absorbed per year since 2014. And then there was the ground game, which seemed to go on sabbatical in the three weeks after second-year running back James Conner rushed for 135 yards in a Week 1 tie with the Browns. After his magnificent performance in Cleveland, Conner combined for a mere 97 rushing yards on 32 carries against the Chiefs, Buccaneers and Ravens, respectively. Sure, you can say the Steelers faced large deficits in two of those games–they fell behind by a combined score of 35-0 in the first quarter of home losses to Kansas City and Baltimore–which necessitated a heavy dose of passing. But the fact of the matter was, Pittsburgh’s hogs got whipped at the line of scrimmage more often than not during that three-week period. But while we’re stating facts, it is worth noting that the Steelers’ offensive line was a bit compromised due to injury over the first month of the season. Veteran left guard Ramon Foster missed the vast-majority of training camp with a sprained knee and surely wasn’t at full-speed at the start of the regular season. Meanwhile, right tackle Marcus Gilbert and right guard David DeCastro, two of the highest ranked players at their respective positions, missed a combined three games due to injuries. Like every other portion of the Steelers’ 53-man roster, I guess the offensive linemen–as formidable as they may have been–couldn’t escape the bumps, bruises and lackluster play that was thematic of the first four weeks of the 2018 regular season. But as we sit here today, those first four weeks seem like a distant memory for the 3-2-1 Steelers, especially for an offensive line that has seemingly taken its play and its reputation to a whole new level. How’s the pass protection been? In the past two games–both impressive and important victories over the Falcons and Bengals, respectively–Roethlisberger has dropped back to pass a combined 75 times without being sacked once. Forget sacks, he’s barely been touched, while passing for a total of 619 yards and five touchdowns. How about that ground game? James Conner has combined for 221 rushing yards and four touchdowns the past two weeks, averaging over 5.5 yards per carry in the process. If you wish, you can talk about the Falcons’ defense and how it was decimated by injuries prior to its arrival at Heinz Field on October 7. But you can’t say the same thing about a Bengals’ defense that arrived at Paul Brown Stadium this past Sunday equipped with a front-seven that included Geno Atkins, Carlos Dunlap and Vontaze Burfict. The Steelers’ offensive line didn’t just dominate the decimated the past two weeks. It dominated the dominant. The Steelers’ offensive line is, again, highly-decorated, highly-touted and, as Pouncey showed when he pulled all the way from the center position over to the right edge to throw the key block on Conner’s 26-yard run against the Bengals on Sunday, highly-capable. The Steelers’ offensive line is also in the zone. If it can stay there for the remainder of the 2018 season, Pittsburgh’s offense–and the entire team–will be pretty hard to dominate.